The Bernese Mountain Dog (also known as the ‘Berner Sennenhund’, ‘Bouvier Bernois’, ‘Bernese Cattle Dog’, or ‘Berner’) is the most well known mountain dog from Switzerland, distinguished by its long, soft coat. Like many breeds, its origins are uncertain, but it likely descended from Roman Mastiffs crossed with sheepdogs during the Roman invasion of Switzerland in the first century B.C. The Bernese Mountain Dog survived for centuries as a draft dog and farm dog, but little effort was put into preserving the breed, which existed only in the lower Alps. This changed in the 1890’s when Professor Albert Heim and other breeders, recognizing the Bernese Mountain Dog’s fine qualities, organized to promote its development. The Bernese Mountain Dog was standardized and shown throughout Europe in the early 1900’s and arrived in America in the 1920’s, achieving recognition from the American Kennel Club in 1937. Since then, the Bernese Mountain Dog has increased slowly but steadily in population and popularity. The Bernese Mountain Dog has a shoulder height of 58-71 cm (23-28 in) and weighs 36-50 kg (80-110 lbs). It is a large, agile dog with a flat, broad skull, dark eyes and nose, triangular ears, scissors bite, and defined stop (point at which the muzzle meets the forehead). Bernese Mountain Dogs have low hanging, thick tails, deep chests, and round feet. Males are larger than females, but both are very strong. The Bernese Mountain Dog is slightly longer than it is tall. The Bernese Mountain Dog is distinguished by its highly recognizable tri-color pattern. It has a solid black body, legs, head and ears, rust or tan colored cheeks and calves, and white chest, muzzle (with a stripe running up to the forehead), toes, and tail tip. The only variation in pattern is the amount of white; a ‘Swiss Cross’ shape of white on the chest (as seen from the front sitting position) is ideal. The Bernese Mountain Dog has a dense undercoat and straight or curly medium-length outer coat. It is highly weather resistant and slightly rough, but not harsh. Bernese Mountain Dogs shed their outer coat year round. The Bernese Mountain Dog is friendly, vigilant, and very loyal to its family. It is intelligent, attentive, and calm. Bernese Mountain Dogs require frequent human companionship. The Bernese Mountain Dog is friendly, vigilant, and very loyal to its family. It is intelligent, attentive, and calm. Bernese Mountain Dogs require frequent human companionship. Bernese Mountain Dogs are great with children and will protect their loved ones. They get along well with cats and other household pets, provided proper socialization has taken place. The Bernese Mountain Dog will announce unfamiliar visitors with a hearty barking and watch them carefully. Bernese Mountain Dogs are dominant towards one another. You can find Bernese Mountain Dog puppies priced from $300 USD to $9950 USD with one of our credible breeders. Browse through our breeder's listings and find your perfect puppy at the perfect price. Bernese Mountain Dogs are great with children and will protect their loved ones. They get along well with cats and other household pets, provided proper socialization has taken place. 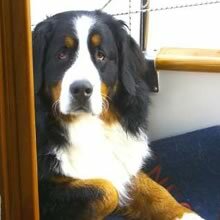 The Bernese Mountain Dog will announce unfamiliar visitors with a hearty barking and watch them carefully. Bernese Mountain Dogs are dominant towards one another. The Bernese Mountain Dog requires regular grooming with a brush and comb, particularly in areas that are prone to tangles (behind the ears, neck, legs, and hindquarters). Daily combing is required when the undercoat is shedding. Ears should be cleaned and excessive hair around the pads of the feet trimmed occasionally. Bernese Mountain Dogs have an average lifespan of only 7-8 years; they are considered ‘old’ at an age of 6 years. They are susceptible to cancer and musculoskeletal issues such as arthritis (particularly in the shoulders and elbows) and hip dysplasia. The Bernese Mountain Dog must be handled with a loving, consistent approach and on an even keel. The Bernese Mountain Dog is an eager learner and is very responsive to its trainer's voice. The Bernese Mountain Dog must be taken outside regularly because it is very fond of exercise and the outdoors. Bernese Mountain Dogs enjoy cold weather and love to run and play off the leash whenever possible. Avoid strenuously exercising the Bernese Mountain Dog when young as it needs all of its energy to put on weight and build strong bones and joints. Bernese Mountain Dog Puppies for Sale - Shipped Worldwide! Finding the right Bernese Mountain Dog puppy can be dog gone hard work. PuppyFind® provides a convenient and efficient means of selecting and purchasing the perfect Bernese Mountain Dog puppy (or Bernese Mountain Dog puppies) from the comfort of your home, 24 hours a day, 7 days a week. Take advantage of our PuppySearch or leisurely browse our directory of hundreds of dog breeds, Bernese Mountain Dog dog breeders, Bernese Mountain Dog dogs for adoption, and Bernese Mountain Dog puppy for sale listings with photos and detailed descriptions. Some Bernese Mountain Dog puppies for sale may be shipped Worldwide and include crate and veterinarian checkup. Many Bernese Mountain Dog dog breeders with puppies for sale also offer a health guarantee. With thousands of Bernese Mountain Dog puppies for sale and hundreds of Bernese Mountain Dog dog breeders, you're sure to find the perfect Bernese Mountain Dog puppy.